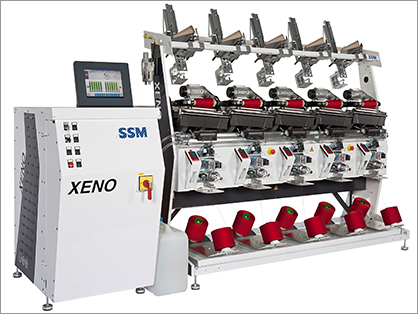 After the successful introduction of the XENO-platform in 2016 and the X-Series in 2017, SSM has extended the range of applications on these platforms. With the brand new drum winder the power consumption per spindle is lower than ever (down to 35 watt, depending on parameter settings). The small pitch and integrated control cabinet maximize the space utilization. Thanks to the new developed and single controlled motor, it is the ideal machine for an energy efficient rewinding of cones used in the weaving, warp knitting and circular knitting process. The new drum winder, named CWX-W, is also available for assembly winding as CWX-D.